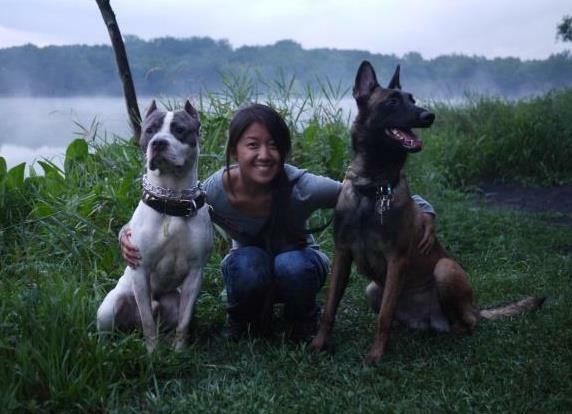 After years of working with, training and rehabilitating pit bulls and other rescue dogs for local animal rescues, Karin Chan started a dog walking business in 2008. In 2010, she decided to professionally certify to become a Professional Dog Trainer. After certification, Karin started an apprenticeship under a Chicago dog trainer who brought Karin into the world of Ring sport and competitive dog obedience. Karin’s training philosophy is one that is based on balanced training. The biggest hurdle in dog training is developing a fair and clear sense of communicating with the dog, in a way that they understand, and reading what they are trying to tell us based on their body language and behavior. Through observing dogs instinctive methods of communicating to one another, behavior in a pack, both balanced and unbalanced, and how our energy and mood affects them, Karin puts together a training plan and system to create an effective learning environment. Karin is an AKC Canine Good Citizen Trainer and Evaluator, professional member of the International Association of Canine Professionals and CSAU Judge for Boxer Club USA. Karin works with American Belgian Malinois Rescue and Woof Project Rescue as an evaluator, volunteer and recommended trainer. She is passionate about continuing education and hosts and attends several seminars and workshops yearly. Karin formed Hey It’s Me Moto, Inc. in June of 2015 and acquired Whiskers N’ Tails, a boarding, daycare and grooming facility in the same month. In October of 2015, Karin officially filed her working dog club, SouthBay Working Dogs, with PSAK9. She also trains to compete in MondioRing and French Ring. In July of 2016, Karin earned her accreditation as a FitPaws Master Trainer and in August of 2016, earned her full accreditation as a Certified Canine Fitness Trainer through University of Tennessee. Chewy’s Dog Gym was formed shortly after. After PSA Nationals 2017, Karin was made Assistant Director to the West Coast Region of PSAK9. We are an Authorized Reseller of Inukshuk Pro Dog Food.